This course will teach you to consider potential impacts from a life-cycle perspective and will help you ensure that the production of your ideas won't accidentally cause harm. Through it, you'll gain an understanding of the impacts of material processes, of different ways to reduce the use of global materials and of the ecological impacts our production and consumption choices cause. You'll discover techniques such as Design for Disassembly, Design for Longevity, Design for Reusability, Design for Dematerialization, and Design for Modularity and will learn to design approaches that minimize potentially negative social and environmental impacts, maximize the regenerative elements, and still maintain functionality, aesthetics, and practicality of products, systems, and services. Sustainable Design & Production isn’t limited just to people who are defined as ‘designers’; the course shares incredibly useful tools for anyone creating things in the world and the eco-design strategies can be applied to any production process. Develop a thorough understanding of the eco-design and circular economy strategies sets and how to apply them. Demonstrate the ability to identify potential impacts and design for minimization while increasing awareness of a variety of methods for evaluating environmental impacts in production. Understand how to use Life Cycle Assessment and other techniques for reducing the impacts of produced goods and services. Push the boundaries of new practices for sustainable production in order to integrate the techniques into your change making practice. Welcome to the Sustainable Design & Production Course! Sustainable Design & Production Course Synthesis - Tying It All Together! Everything that is created requires something else be destroyed; it’s the egg expensed for the omelet, for example, so we need to be armed with the knowledge and techniques to predict and reduce the impacts associated with the things we are responsible for bringing into existence. When we create anything, right from the conception stage we must use a life-cycle perspective to consider the potential impacts that its form will have and then design approaches that minimize potentially negative impacts while maximizing the regenerative elements. 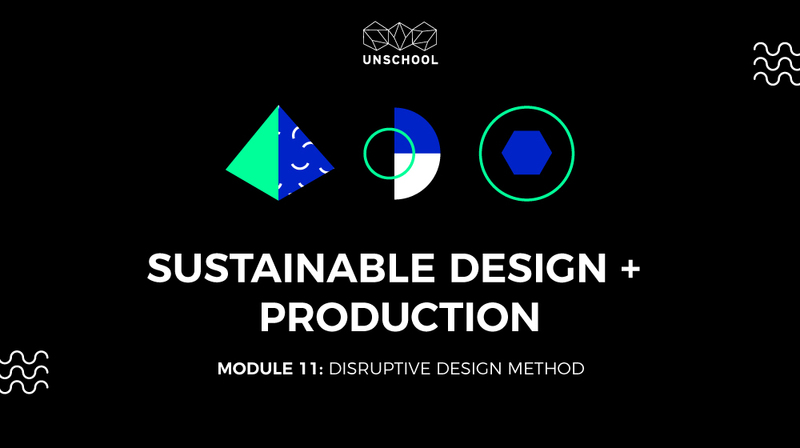 This class explores the history, theories, and leaders in sustainable design and production. You’ll learn a wide array of techniques and tools that producers and idea activators need to know when designing interventions that embrace low-impact outcomes, and you’ll be able to evaluate which of those techniques will best serve the project at hand. You may be aware of the impact that design has – intended or not – in the big three systems (ecological, social, industrial), and it's been estimated that the design phase impacts around 80% of products’ impacts. The ecodesign strategy toolset combined with the circular economy and a host of other thinking and doing tools presented in this knowledge session will help you create more sustainable products, systems, and services in your change-making practice. Through a fascinating exploration of case studies, you will learn how to implement eco-design strategies and sustainable production practices. We also take a deeper look at circular economy models and methods for evaluating impact, and then we’ll tie it all together by exploring how to use this knowledge for creative change making through the Products-Service Systems model. This knowledge session provides the framework for thinking through production and project evolution to build more sustainable solutions into the design of products, systems, and services. It’s an enrichment opportunity for change makers who want to better understand how to create interventions with a low-impact outcome. Let’s get started!